Nothing quite shakes a character up more than when faced with one of the truly note-worthy creatures from the Fiend Folio. When a character has done something so foul, so against what his deity stands for, that person may well receive a visitation from the Hound of Ill Omen. 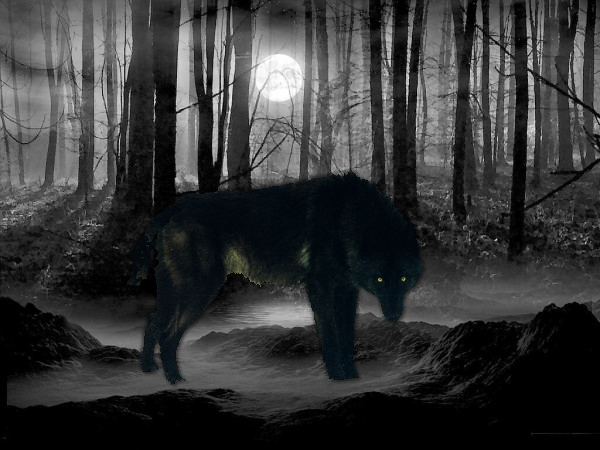 One of the legendary beasts whose appearance usually portents death, this beast appears in the form of a dark, shadowy wolf-hound, five feet tall at the shoulder. When it appears it is only visible to one member of a group, and it is only visible for a few seconds. The person sighting the hound will hear it emit a booming howl before it vanishes. This howl cannot be heard by anyone save the single creature viewing the hound. The howl, in effect, curses the opponent in that the next 1d10 wounds taken will deal quadruple damage. Also, until the requisite number of wounds is taken (i.e., 1d10) no healing (magical or otherwise) is possible. If remove curse is cast on the opponent within 10 minutes of viewing the hound, the curse is halved (i.e., only the next 1d5 wounds taken will be quadrupled in damage). The hound cannot be harmed or driven away by any means, and legends say it only appears if a creature has seriously offended his deity. It is rumored that only one hound exists. To set up this encounter, I like to have a precursor, the sound of a wolf growling close by. First to the left, then to the right, then directly in front of the offending character. On this page: http://www.searchingwolf.com/howls.htm Wolf Growling fills this void. Them to complete the encounter, on this page: http://www.wolfcountry.net/WolfSounds.html Lone Howl sample 1 is a solid sound file for this encounter. Looks like the Wolf of Ill Omen -cool pic, though!